Info "Hey, you! Betcha don’t know how to use an old-school can opener! Grab hold of it and rock it up and down." Yes, You Can! 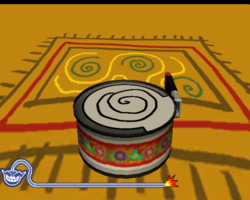 is one of Penny's Microgames in WarioWare: Smooth Moves. The objective is to open the can with the can opener. First the player must yank the Wii Remote towards themselves and then move the remote forward repeatedly to open the lid. 1st level difficulty: The can is nearly open already. 2nd level difficulty: The can is a quarter open already. 3rd level difficulty: The can is half open already. This page was last edited on February 20, 2018, at 16:07.